OMG OMG OMG Prince Harry is single again. He and Cressida Bonas - our favorite scrunchy-wearing royal consort - are splitsville. Whyyyyyyyyyy did this happen? Time thinks it has to do with that Joe Millionaire spinoff, I Wanna Marry Harry, in which producers "trick" American women into thinking they're dating the Ginger Prince. Maybe the ultimate trick is that they are actually courting the younger Windsor; I'm getting whiplash just thinking about it. 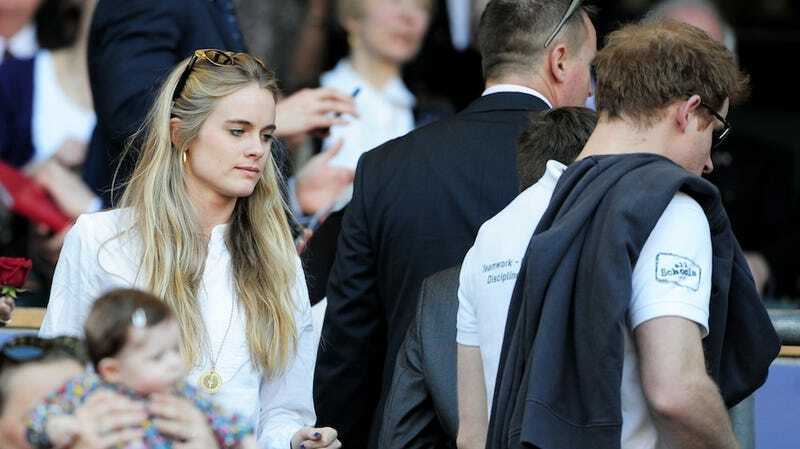 Or maybe Cressida, just like Harry's previous gf, Chelsy Davy, doesn't want to be a royal wife, or to deal with the pageantry/hassles attached. Remember when she gave up a fledgling dance career to be with him? A profession where her scrunchies would actually come in handy? That seems most plausible to me, that ultimately Harry couldn't match up to Cressy's One True Love.